I think a lot of the way we perceive and appreciate art has to do with our prior expectations. Coming up against something new with an open mind is one thing – you’re prepared to understand it while not clinging to your own pre-conceived notions – but it definitely implies the existence of such notions. And sometimes a big part of the reason why we don’t warm up to a book, or a movie or whatever, is that it doesn’t live up to what we expected of it. Having an open mind would, in this case, mean being able to discern between disappointment caused by thwarted expectation (or perhaps unreasonable expectation) and disappointment caused by actual failings in the oeuvre itself. But since I’m not any kind of critic, I don’t really feel the need for such objectivity, and I can say that I was quite disappointed in HP Lovecraft, precisely because it’s not what I expected it to be at all. And the disappointment starts on page 1, with The Rats in the Walls – which was very…poe-esque (and I guess the name of de la Poer is a big clue) and which, because of this similarity, made me think I would have enjoyed the book so much more at 16. (An impression I still hold even after going through all the stories). The second story in the volume (The Picture in the House) features a 1st person narration which put me in mind of a most pretentious individual, employing rather abundantly adjectives, adverbs and somewhat archaic turns of phrase, while the narrator in The Silver Key seems to be poised for a pity party. He comes from this long line of ‘delicate and sensitive men’, who have the power to dream and see beyond the common, everyday, world. To me, it was basically a sullen teenager telling himself ‘I’m special, that’s why no one understands me’. But I should get to the good – as little as I found in it – and that is The Shadow over Innsmouth. It was, to me, by far the best story of the bunch. And it reminded me of a couple of Neil Gaiman stories inspired by Innsmouth which I re-read & enjoyed even better than the first time (especially Shoggoth’s Old Peculiar, which I now got). Anyways, I guess in the early 20th century Mr. Lovecraft’s creatures were a peculiar curiosity (and believed to be the by-product of a sick mind), but now, with movies and TV, our tolerance for violence and gore is much higher, so a sea creature like Cthulhu isn’t exactly in the position to bring on the horror. 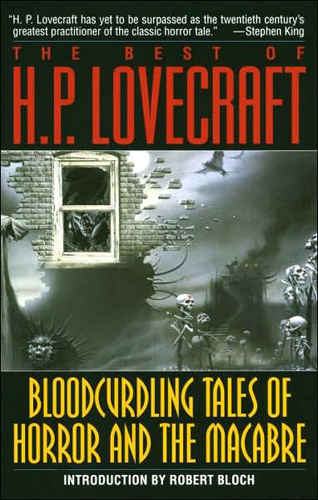 HP Lovecraft is a sort of cult author – and I took AV Club’s suggestion when I got this book – but it’s just not the cult for me. I don’t read horror, but, if I made an exception, I actually wanted to be scared, not bored out of my mind. Oh, and one last thing – I don’t know if it’s this edition in particular or if it was the intention of the author all along, but why did the ‘key’ phrases have to be italicized? The reveals are, generally, obvious enough without being graphically shoved in your face. In the end, it’s all for the best, at least I now actually know exactly what people are talking about when they’re discussing the Cthulhu mythos 😀 I’m still open to suggestions for some good horror = preferably not Stephen King though ;). ~ by ameer on July 12, 2011. Well, ameer, I will not defend Lovecraft’s craft again, since we already had that talk:) Also, to be honest, I really like and agree with your arguments supporting the idea that the new types of representation (audio, video, VR) managed to somehow banalize written content and mutate our imaginative capabilities. Well, life and literature go on, anyways. Suggestions? Mmm. Poe’s ‘Tales of Mystery and Imagination’ is all you need:) It’s the only book I always kept on my desk. Unfortunately, I only have those latter books in French and/or Romanian. Your call. And, at least this time, you can just leave expectations at the door, wander freely thru the dark rooms of his fiction (‘Krucifix’ is a masterpiece, imho) and be ready to face the monsters. And buy more light bulbs, just in case.